The Riva-T is essentially a cosmetic variation on the typical Riva/eGo electronic cigarette design and its unique features make it a worthwhile addition to this class of device. It’s not quite perfect, but does make for a pleasant vape in a convenient package. The Riva-T kit comes attractively packaged in a conventional two piece box with all components securely held in place. This applies to the lower tier as well, where the charger and cord have their own cutouts rather than boxes. 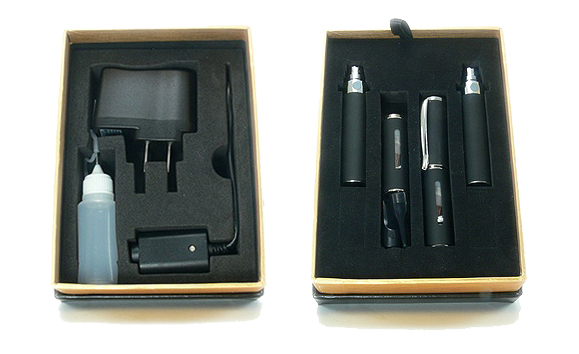 The kit includes two batteries, two tank atomizers with mouthpieces and one pen-clip top. Only the single top keeps this kit from having two full electronic cigarettes, but they can easily be used without the cap. Also included are a bottle for filling the atomizers, a USB charger with wall adapter and an instruction booklet. The included batteries are standard 750mAh Riva units, which is a good thing. These are typically regarded as some of the most reliable and best performing fat e-cig batteries. The high marks in performance come from the fact that regulated output from Riva batteries is 3.7v, higher than that of the typical eGo. The recently released 3-click shutoff feature is present on these batteries, meaning that three rapid presses of the button turn them off to avoid unintended firing. The outside threads are compatible with other Riva/eGo accessories and the connection threads are standard 510 design. 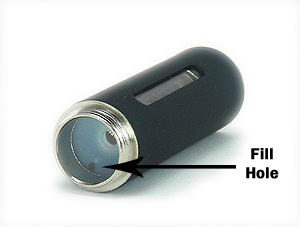 The notable feature of the Riva-T lies in the tank atomizer design. Actually, the term “tank atomizer” is somewhat of a misnomer. The design shares more characteristics with a CE2 style cartomizer than it does with an atomizer and tank setup. The 2.6ohm coil is integrated into a 2ml tank that must be filled with a needle-tipped bottle. Unlike some cartomizers that share this design, however, these cartomizers seem to perform exceptionally well with no apparent issues with liquid delivery to the coil. They provide a consistent vape through all 2mls of e-liquid. The cartomizer is surrounded by a metal body of the same diameter as the battery with view windows on either side for judging liquid levels. The kit includes two flat tip mouthpieces that are enjoyable to use and insert securely into the cartomizer. Filling the cartomizers is quite simple using the included needle-tipped bottle. Simply fill the bottle with e-liquid, insert the needle into the small hole near the edge at the top of the cartomizer and fill until the view window shows full. Filled nearly to the top of the view window, the cartomizer will hold up to 2ml. Remarkably, the included instructions omit any reference to the filling process and simply advise to screw a cartridge on and vape. Step 1 of the instructions states that, “[sic] After entirely assembled, when you press the manual switch, the Riva-T will be activated to vaporizing.” It is not until step 6 that “unscrew the tank atomizer from the kit, and screw the full one on to use” is mentioned and while there is a picture of the needle tip inserted into a cartomizer, there is no mention of the refilling process. An inexperienced user following these instructions could easily try to vape a dry cartomizer, which would almost certainly burn it and render it useless. EVCigarettes includes more appropriate instructions on their packing slip, which is helpful. The top of the cartomizer has the same threads as the outside of the battery and these are used to connect the other notable feature of this kit, the pen cap. The cap screws on and protects the mouthpiece and gives the unit the appearance of an expensive pen when not in use. With the cap attached and the battery turned off, the Riva-T electronic cigarette is about as pocket friendly as it gets. At 14mm with the pen cap on and 13mm with it off, the Riva-T is only slightly longer than a typical Riva with a cartomizer and drip tip. A 2.6ohm cartomizer mated to a 3.7v battery is not a great recipe for a satisfying vape, but in this case the combination works quite well. The draw is light and airy, but results in a surprisingly potent throat hit and a large amount of vapor. There is no mistaking it for the warmth off a high voltage or low resistance device, but it exceeds the expectations of a standard electronic cigarette. Flavor is also above average and is delivered through the entire 2ml of e-liquid. This is one of the better large capacity cartomizer/tank electronic cigarette kits that I’ve tried. One issue that did become apparent during a few days use was the random e-liquid in the mouthpiece. Getting e-liquid in the mouth is never enjoyable and it is uncertain what prompted it to happen a few times with the Riva-T. The way the unit was carried or stored seemed to have no correlation, nor did the level of e-liquid in the tank. It doesn’t seem to be a major issue, but bears watching. The Riva-T incorporates several features that make it an attractive device. The 2ml tank, pen clip cap and 3-click protected batteries combine to make a convenient and functional device and the vape is enjoyable and consistent. Poor documentation and the proprietary cartomizer design are the only significant flaws in the package, but Riva/eGo/510 compatibility ensure a useful lifespan regardless. Liquid in the mouthpiece is minor issue that may be annoying if it persists over time. EVCigarettes and Goodejuice are two vendors are carrying the Riva-T electronic cigarette kit. EVCigarettes also carries the replacement cartomizers. At $61.95, the EVCigarettes kit is more expensive than the $49.99 kit from Goodejuice, but includes two free 10ml bottles of e-liquid and a 10% discount with the coupon code vapingguides. Considering the added features, the pricing is comparable with other Riva/eGo kits on the market the Riva-T earns a recommendation for beginner and veteran vapers alike. Just don’t follow the instructions too closely.